Aesthetically clean and simple, even with a squirrel cast into the side walls. Glass front gives mesmerizing “camp fire” experience. Relatively light (not light in any absolute sense, but I was able to drag it into my site by myself). Very small rear clearance because of integral heat shield. Wood length of 12″ means you have to cut “custom” firewood. Expensive ($1100 for stove + $500 for chimney and pipe). On balance, I’m quite happy with this rig. 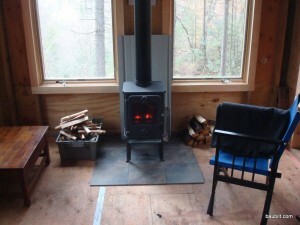 With really dry hardwood, it will bake the cabin even in the middle of February. It will run for 4 hours on a low setting, which is long enough for me. 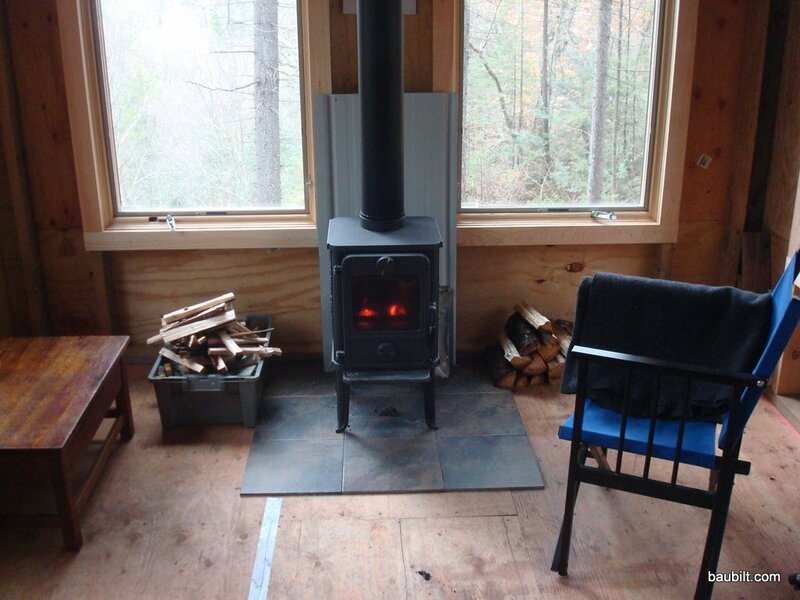 As with any woodstove, you benefit from bone dry wood. Of course, I have plenty of wood on site. Still, I like to cut up shipping pallets at home and carry a few gray bins of really dry oak in with me. With a stove this small, and with dry wood, I only need about 70 lbs. of wood for a winter weekend. Good choice, nice report and great picture, the 1410 Squirrel has been around in many markets for quite a while; I’m sure it is proved and tested by now. MSRP in the US is $999.